The Varigate 8+ from Malekko Heavy Industry has quickly gained a reputation as a complex gate and pattern sequencer, pairing with the Voltage Block as a formidable modulation source. The module provides a number of methods to create a pattern, as well as adding depth and variation. 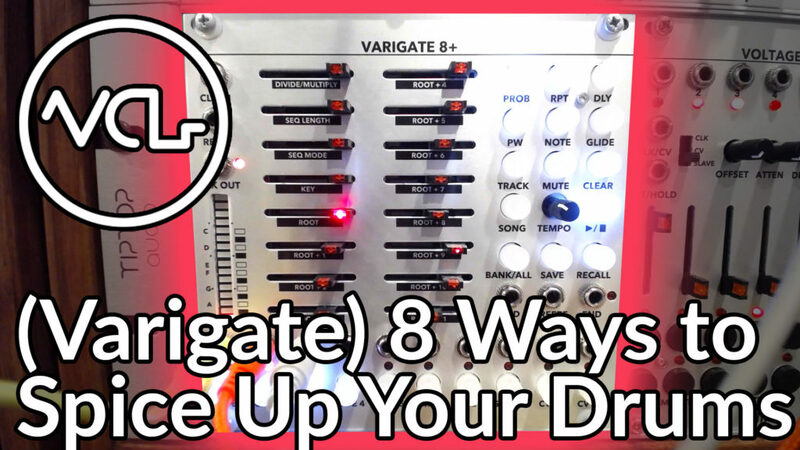 The Varigate 8+ is an 8 channel 16 step gate pattern sequencer, with two additional channels of CV sequencing and a boatload of additional features. Like the Varigate 4, gate, repeat and step delay can all be assigned per step, as well as assigned probability values for more generative patterns. Programming a sequence or group of patterns and saving the state into one of the 100 preset slots is easy, simply hold the save button and the gate channel button switch to save slots. Using the save functionality as a starting point, we can generate a pattern and save it as a return point. The pattern can be subtly or dramatically changed by hand, and then quickly recalled using the Recall button. Entering track mode, we get even more control over each of the 8 gate channels, including clock division/multiplication, sequence length and sequence mode (or playback direction). Switching sequence mode, individual patterns can be thrown into reverse, pendulum (forward/reverse) for odd timed sequences or random. A quick recall of the saved state will return these settings and the patterns back to the original groove, making this a great tool for both complex rhythms as well as drum fills. Rotate pattern mode is another interesting and fast method to get weird, pattern combinations and variations. By entering mute mode (hitting the mute button) we gain access to three independent functions according to the respective flashing bank, save and recall buttons: mute, randomization mute (disabling random gate mode on that channel) and rotate pattern mode. Hitting the recall button will enter rotate pattern mode, which allows any programmed sequences to be shifted to different gate outputs. By pressing the gate channel buttons along the bottom of the module, we can shift the patterns to different channels. Random Gate mode takes things in another direction, allowing a external gate signal to trigger randomization in the patterns. This mode is accessed by pressing the bank and prob buttons, indicated by the flashing of these buttons. Upon entering this mode, the gate channel buttons switch function, now determining the amount of randomization of the patterns when a gate is received. Pressing the gate 1 button sets a low amount of randomization, ascending up to 100% randomization by pressing CV 2. This mode also splits the first and last sets of 4 gate outputs, each performing different roles. In random gate mode, the first 4 outputs on the Varigate 8+ will randomize between different drum maps (pre-programmed drum pattern loops). Each gate will take the role of a certain drum in the kit, gate 1 acting as the kick, gate 2 as snare, and gates 3 and 4 as closed and open hihat patterns. Gate outputs 5 through 8 will produce actual randomized patterns, not tied to any drum map or existing pattern. Triggering randomization is as easy as sending a gate into the RND gate input… I was having fun using Pressure Points for this, though the Mikrophonie might be an interesting pairing as well. We’ll have much more coverage of the Varigate 8+ and it’s partner in crime, the Voltage Block, in the coming weeks. How are you getting complex patterns and drum fills from your module? Tell us about it in the comments! Copyright © 2019 Voltage Control Lab. Powered by WordPress. Theme: Spacious by ThemeGrill.